Nearly everyone's favorite holiday, including interior designers, is fast approaching. Stores are filling up with red and green items with which you can decorate your home as fast as you can "Santa Claus is coming." The classic and most recognizable complimentary color combo got me thinking about using the other color pairings in interior design. First, let's get our terminology down so we're all on the same page by examining the color wheel below. You'll notice there are primary colors, secondary and intermediate (also known as tertiary) colors. A complimentary colors are the primary and secondary colors that are directly across the color wheel from each other: red-green, yellow-purple, blue-orange. A secondary color is created by combining two primary colors - yellow + red =orange, as an example. An intermediate color is created by combining a primary with a secondary either to the left or right. For example, combining yellow and orange creates yellow-orange, or red and purple creates magenta. Now that we have the terminology all down. Let's get started with smart ways to use complimentary color combinations in your next design project. Start with a base of neutrals and decorate with the complimentary colors. In the rooms below, the designs start with neutrals - browns and grays, with the two complimentary colors layered on top as accent colors. The way in which the two colors play off each other makes each one seem more colorful. By starting with neutrals, you can relatively easily switch out colors down the road with changing tastes. 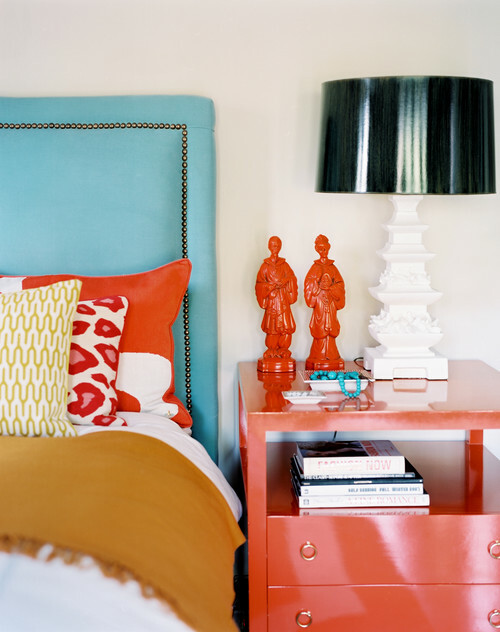 For a bolder look, use the complimentary colors on the furniture pieces. 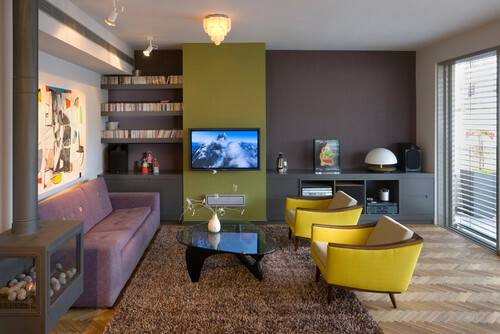 In the room below, you'll notice the structure of the room (walls, floor, ceiling, other surfaces) are all done in neutrals, but the furniture pieces are bold and bright in yellow and purple. The larger piece is done is a toned down purple to keep it from overwhelming the space. Bright canary yellow chairs make a statement. Use off shades to keep the combinations fresh. This one is the big risk for designers and their clients. If you want to go really bold, go with slightly off colors to keep the look from being too "clown house." In these two rooms, intermediate colors across the wheel from each other were used to make strong color statements. An orange-red is paired with a light teal, and a magenta is paired with lime green for two beautiful room settings. 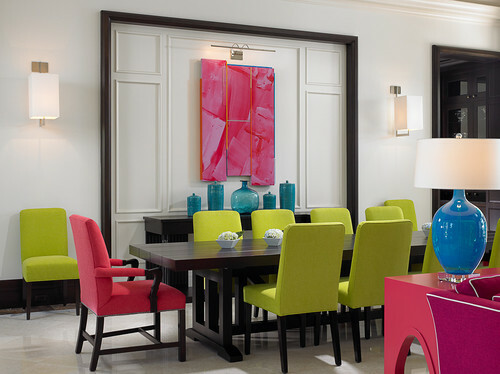 Tropical Dining Room by Toronto Interior Designers & Decorators John David Edison Interior Design Inc. I hope these combinations have given you some inspiration in your own homes. Which complimentary color is your favorite? And, which one would you most likely implement in your own home? And, if you're unsure how to get the colors just right in your home, you know who to call!